When the series 1 e type Jaguar first came out like many other cars in this period Jaguar fitted the e type with crossply tyres. The e-type initially had 6.40H15 Dunlop RS5 tyres. These of course are only currently speed rated to 130mph. Radial tyre technology was available when the e-type Jaguar was first made, and Jaguar offered radials as an option with the XKE. An e type could come with the Dunlop SP41, which is no longer made, & In period Jaguar said, "to fit the SP41 to your XKE you should have it restricted in speed". Jaguar had previous experience of radial tyres offering PIRELLI 185VR16 CINTURATO ™ CA67 tyres with their XK150; so for the discerning motorist, that could afford it, Jaguar offered the 185VR15 PIRELLI CINTURATO ™ CA67 HS tyre as their High Speed radial option. Today the PIRELLI CINTURATO ™ CA67 tyre is the only original equipment radial tyre that was offered by Jaguar with early series 1 e type. In 1968 the XJ6 was available with the ground breaking new 70% profile tyre the ER/70VR15 Dunlop SP Sport also known as the Aquajet. At this point the series 2 XKE fitted 185VR15 Dunlop SP Sport Aquajet as standard. 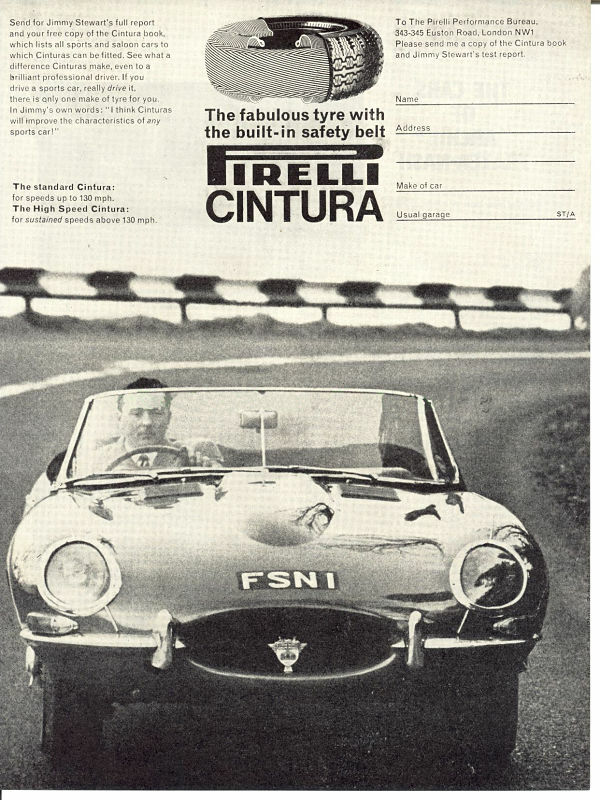 However the 185VR15 PIRELLI CINTURATO ™ tyre CA67 is still a ideal radial tyre for the series 2 XKE. When Jaguar released their series 3 XKE they fitted the new technology 70% profile tyres, but to counteract the new bigger foot print Jaguar also fitted power steering to the Series 3 E-Type. These bigger tyres did give greater road holding but the handling would have been heavier so Jaguar fitted power steering to counteract the effects of the heavier steering. It is a common mistake thinking that fitting the fatter series 3 E-Type wheels and tyre to earlier cars will improve the driving experience, but it will be heavier which is why Jaguar did not do it until they had power steering. PIRELLI make a 205/70VR15 CINTURATO ™ CN12 tyre for these cars which has an extremely high W speed rating. There are companies like Lynx and Eagle that do some amazing upgrades to XKE jaguars, particularly to the steering, that can counteract the effects of the fatter tyres on these earlier cars. They are extremely clever and well put together upgrades. But this does raise the question of how do you your E-Type. Do you want it the way it was or do you prefer a more modern piece of machinery in an old shaped body. It comes down to personal taste in the end. However for series 1 & 2 XKE Jaguars the 185VR15 CINTURATO ™ CA67 is unbeatable; and for heavily modified early XKE and series 3 cars the CINTURATO ™ 205/70VR15 CN12 tyre is perfect. This is PIRELLI's period promotional film demonstrating the benefit of fitting the radial 185VR15 PIRELLI CINTURATO ™ tyre on an XKE Jaguar.